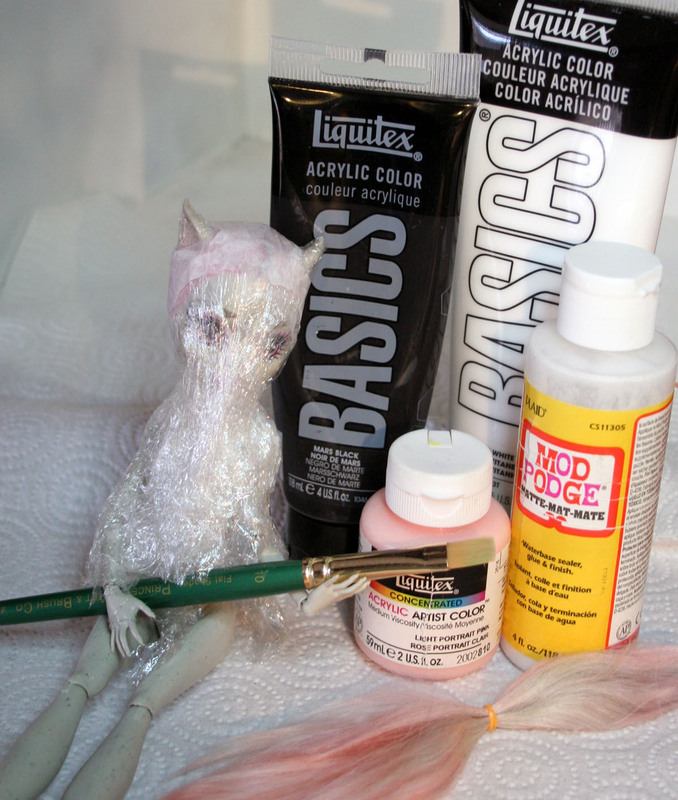 Now it is time to add color to the wig cap. I am using a combination of 3 colors, but you can use just one if you like. 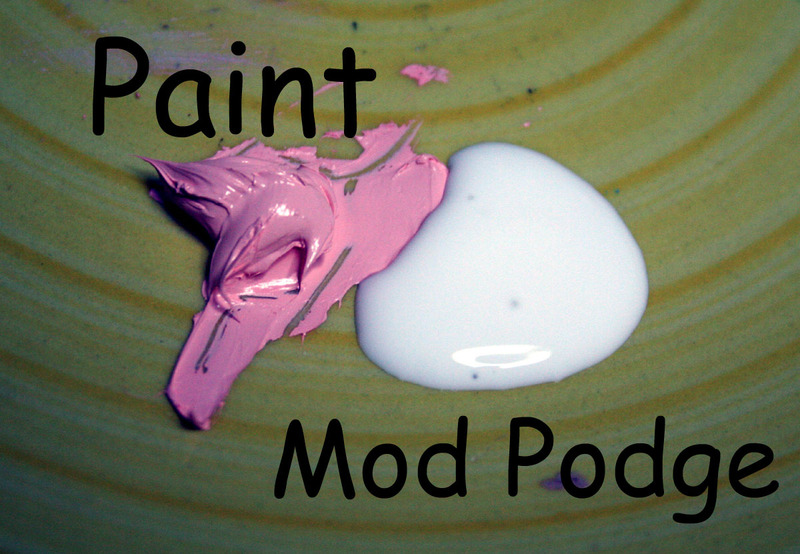 The tricky part is making sure you get some Mod Podge mixed in with your paint. Why? 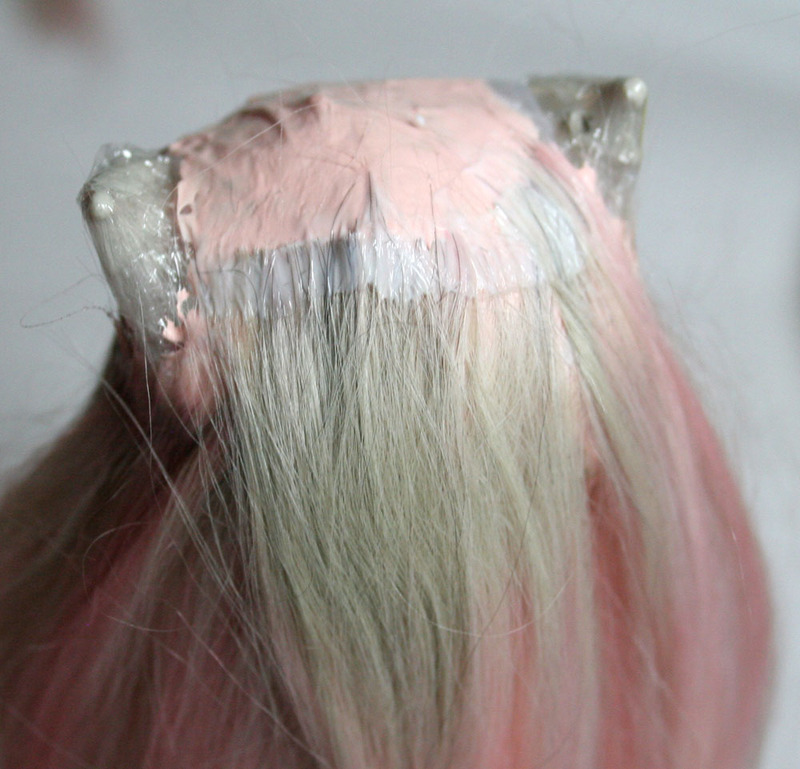 So the paint will not separate from the wig cap. 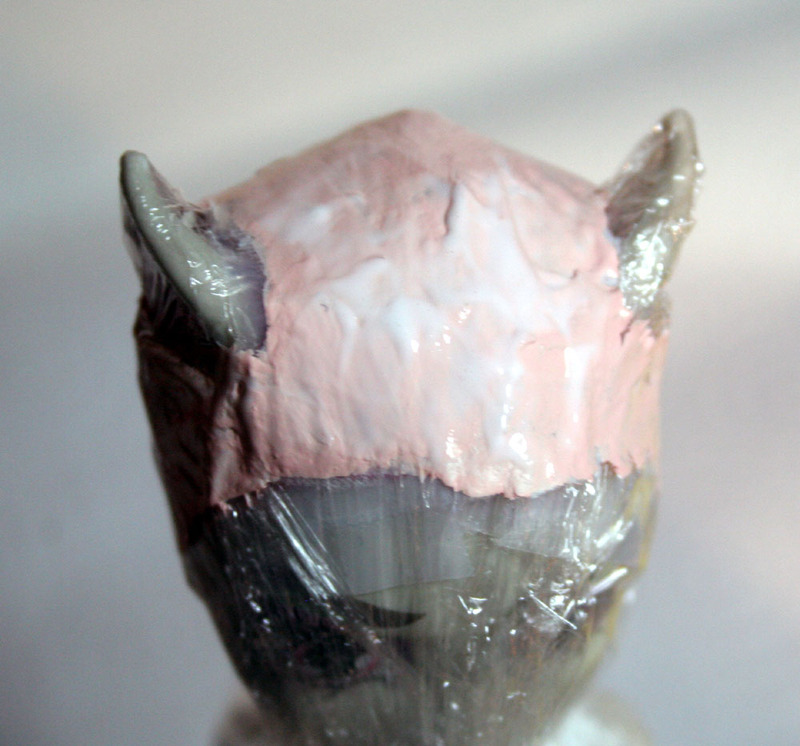 Like tends to stick to like in the world of glue and paint. 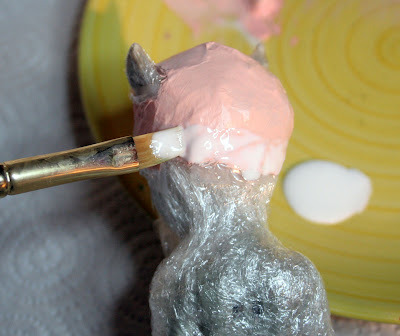 The paint will tend to want to go its own way without adding the Mod Podge. 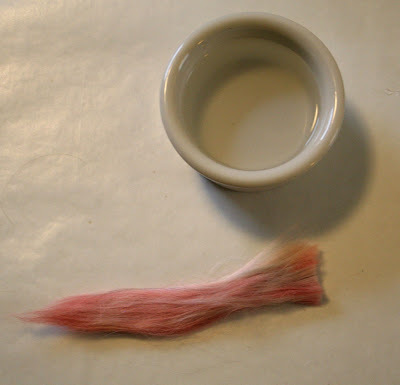 If you don't want to mix paint, just use a middle hue of pink like what you see in the photo. Compare your color to the hair you are using to be sure it will not stick out like a sore thumb. Mix the paint and the Mod Podge 50/50 - and remember, the glue dries clear. 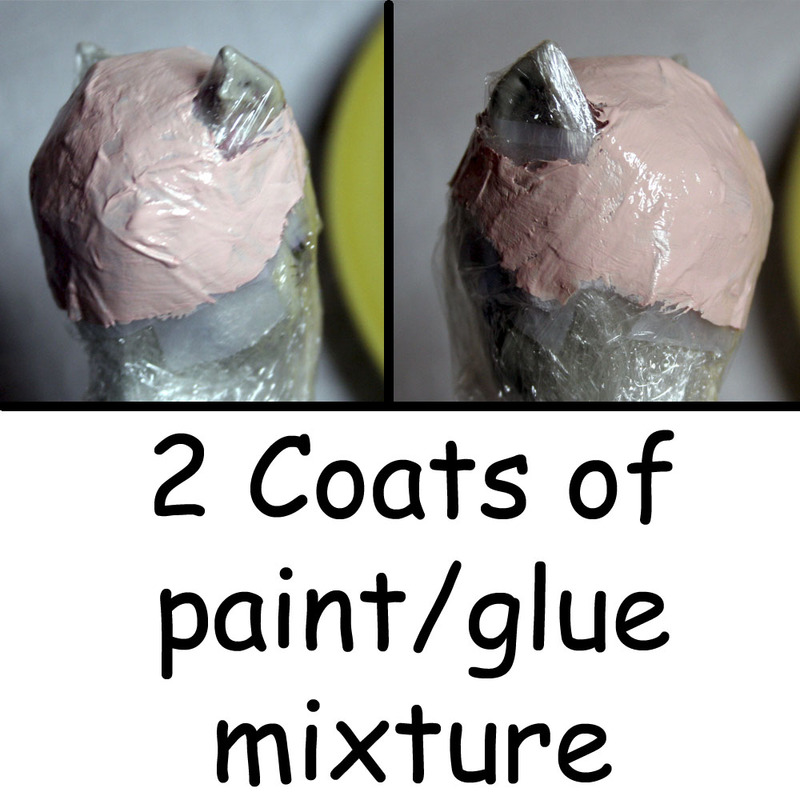 2 coats of the paint/glue mixture need to be applied and allowed to dry. Follow the paint/glue mix with a coat of straight Mod Podge. 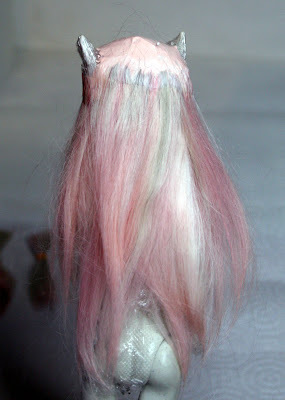 I have cut a hank of hair that I like and am going to begin applying it at the base of the hairline in the back. I put Mod Podge along the hairline. 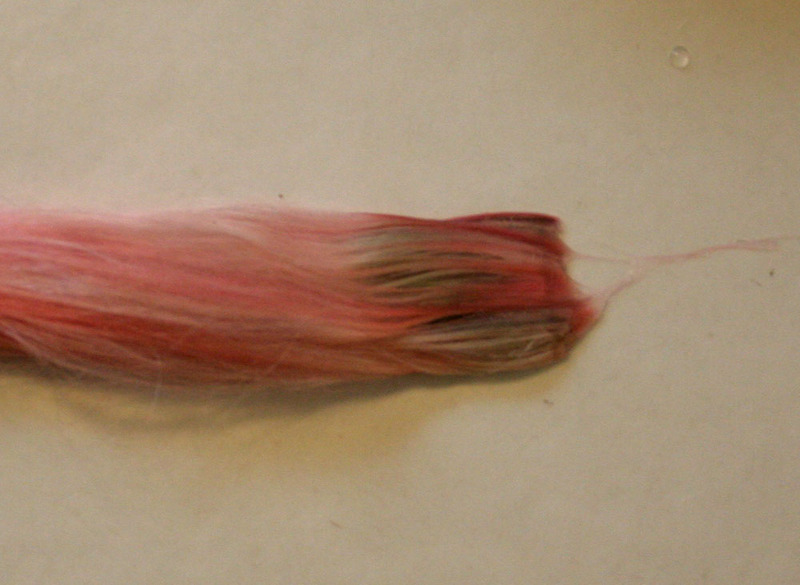 fingertip and let it dry for a few minutes. 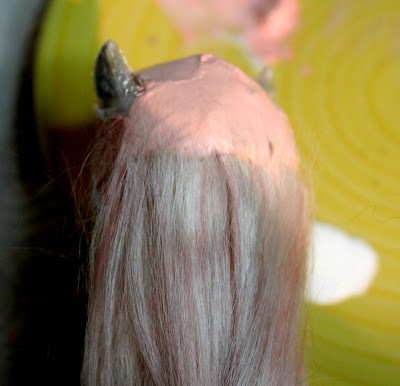 After it has dried some, I add more glue on top of the loose hair. 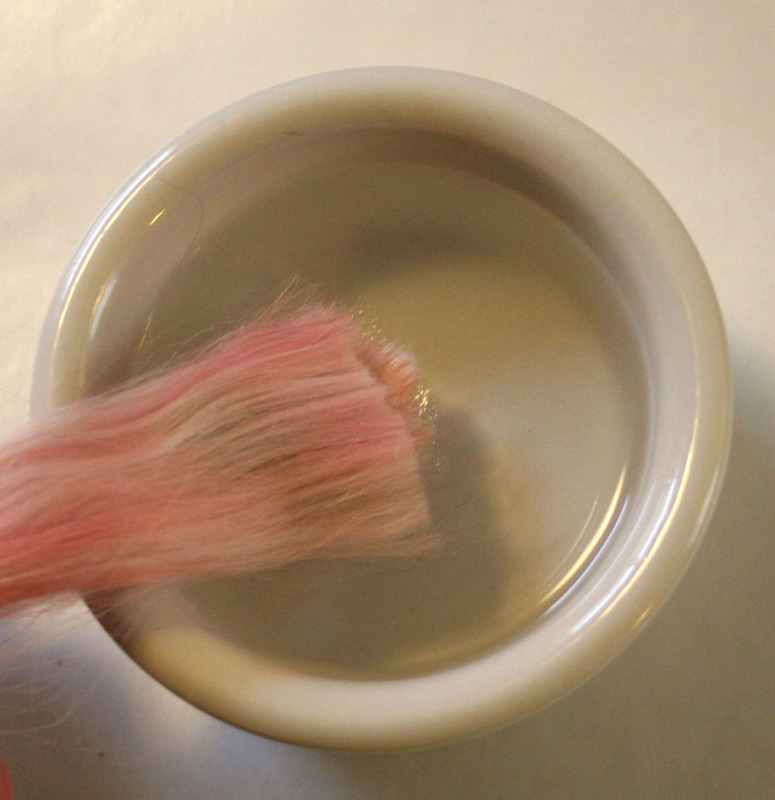 I work it into the hair gently with the paint brush. The area is about 3/8" or 5mm between the arrows. Continue going around adding the hair in layers. I am at the halfway point here. this will be for Rochelle. I have added 2 more rows of hair. sides next to the ears. - flatten it against the wax paper. 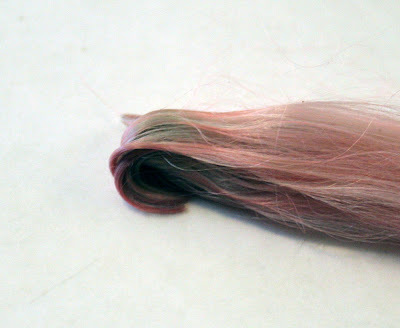 Then roll the hair end under and fingertip press. Let it air dry on the wax paper. 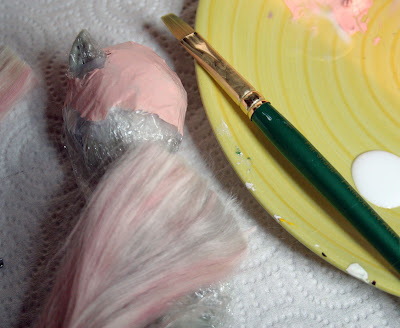 I am posting this without photos of the finished wig- too much going on right now- but- you can still finish your wig! 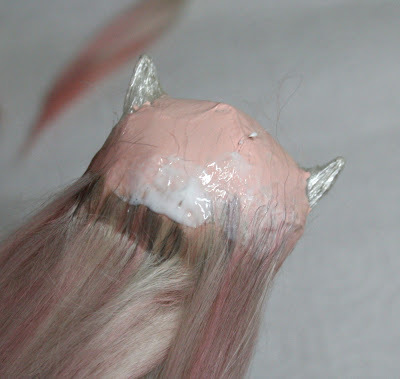 Use the now dry hair that is set with a bend and glue the underside to the wig base. This hair goes around the ears and also creates bangs. When I get time, I will put in the photos of the finished wig. Remember to leave a comment for an entry for the January Drawing. This month's prize will be an assortment of hair for making your own wigs or to re-root your favorite doll. I will post a picture of that later as well. I really have enjoyed the tutorial. Plus, I also thank you for the link to the rooting tool. I was able to see what it looked like and am making my own. Can't wait to try it. My biggest hurdle is the thought or repainting the face. I have many barbies, kens and gi joes to re do for characters. Thanks again for the tutorials. What a great way to make a wig! I'm looking forward to trying it out! 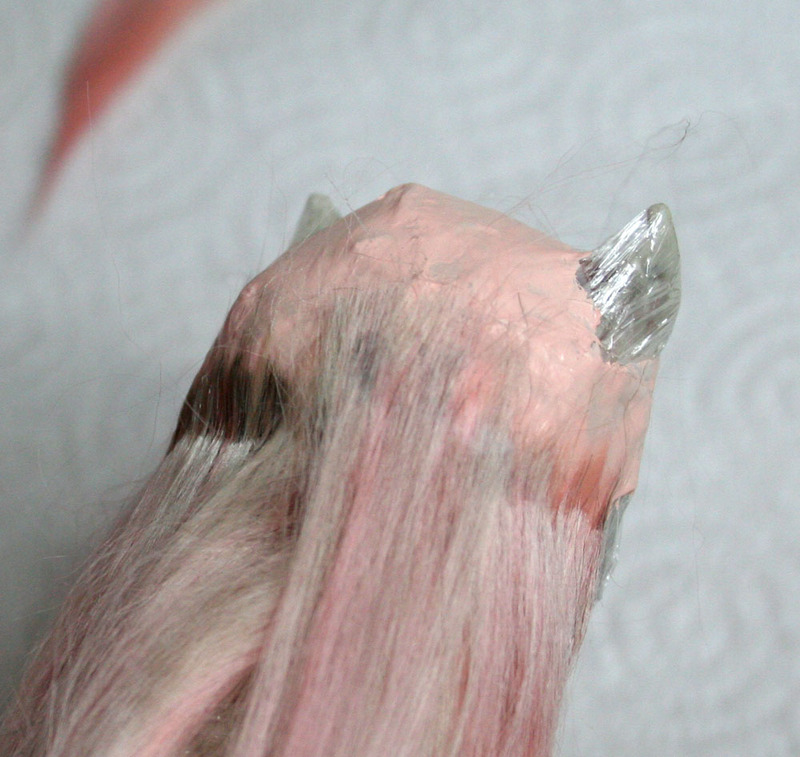 I am looking forward to seeing pictures of the finished piece! I cannot wait to see the finished product; I love thumbing through your tutorials, they're always so entertaining! Oh this really interesting! 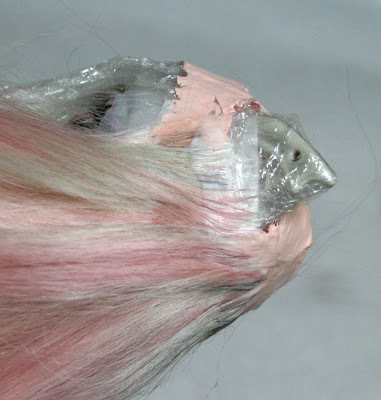 I was looking at possibly making a wig or two for my MH dolls and this technique is great. Thanks for sharing! Oh this technique looks really interesting. 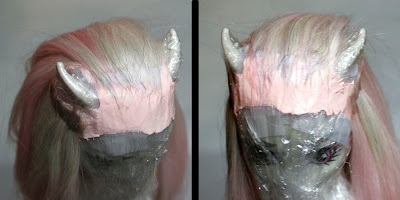 I was looking at either rerooting or making wigs for some of my MH dolls. 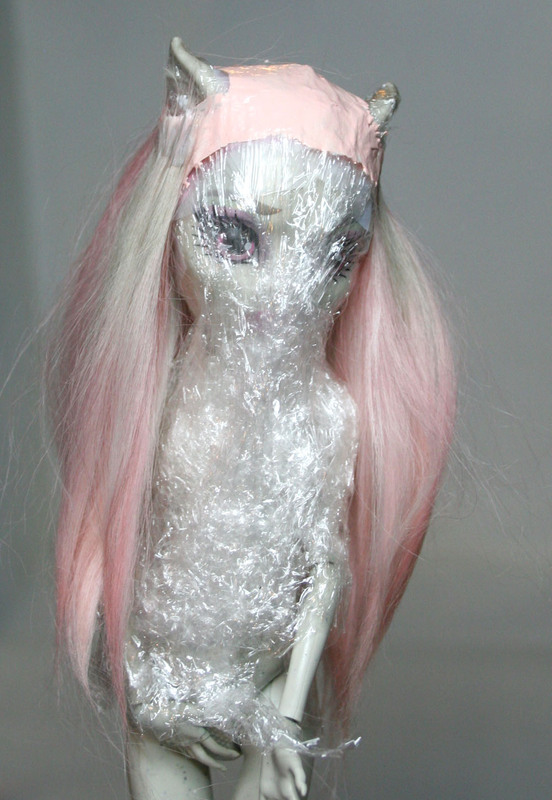 Thanks for sharing and can't wait to see the finished Rochelle! I love the colors you chose, they really fit Rochelle perfectly! I just know the finished product will be beautiful. Thanks so much for this! I'm making a pirate custom with my broken Rochelle and I want to do a wig instead of a reroot. This is a great help! Thanks so much! 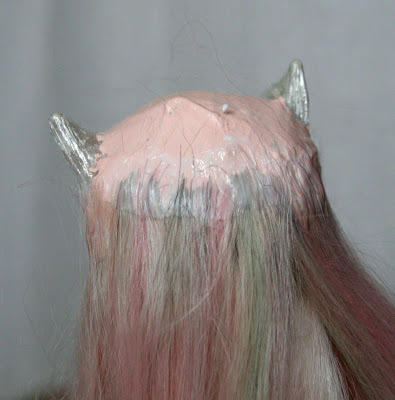 This wig is being made for a custom painted doll. The only water the wig will see is the water I used to bend the hair and what I might use to style it on the ends. 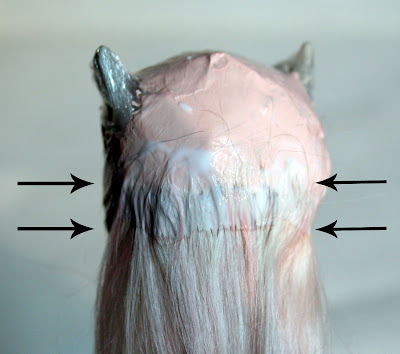 Even waterproof glue wouldn't hold if you dunked something like this in water- I would never advise anyone to clean a wig like this in that way. 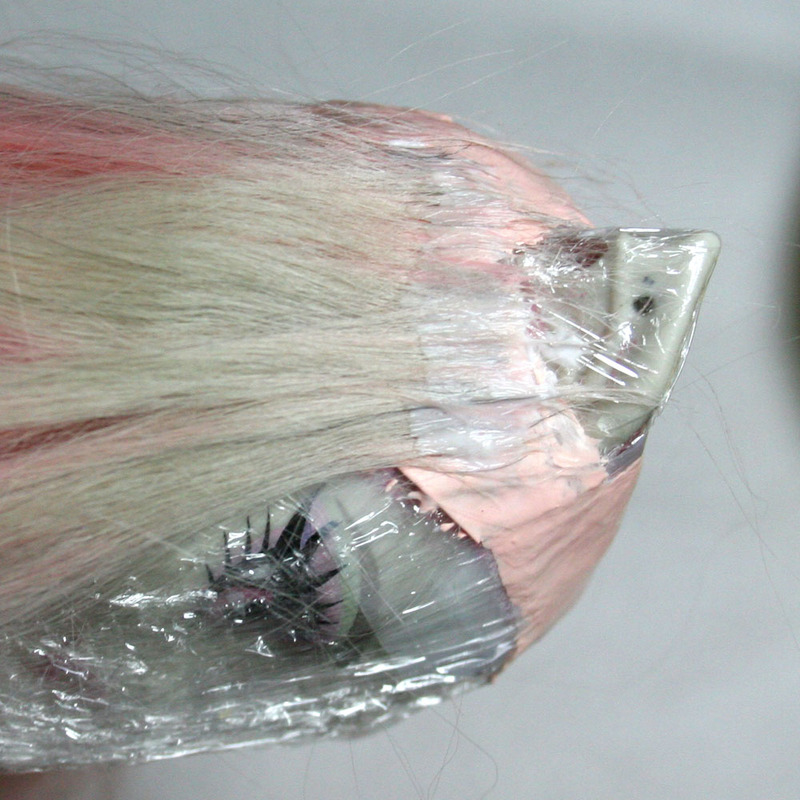 I have never washed a doll wig. 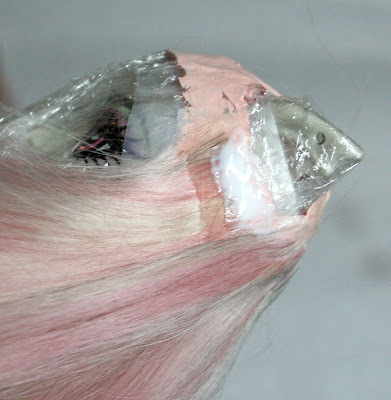 I don't recommend it even for sewn in real human hair wigs. Instead I use an old method with towels and sponges. It is very easy to damage wigs and textiles if you are not careful. The CAMs are easy to get the heads and legs off of- so I would say they are a little easier. Customizing takes patience and practice. 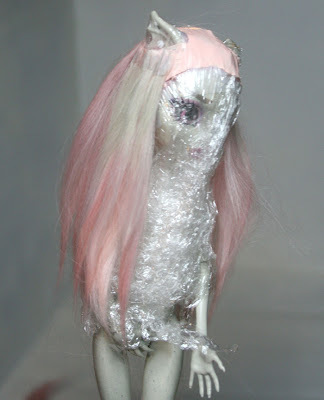 I recommend people start with a Barbie or other doll from thrift or second hand store to practice on first. do u have any new custom MH?